A ‘pastorela’ is a holiday theatre form practiced in many Catholic Mexican communities. The plays begins at the moment in the Nativity story when the Shepherds receive word from the Angels that baby Jesus has been born, and they must travel to find him. Along their journey the shepherds are tempted by the 7 deadly sins, resulting in a battle between Angels and Devils for their souls. La Pastorela de Yakima was written by Father Jack Bentz, and I served as the director for three years. In many traditional pastorelas, the Devils embody the temptations and challenges of the specific community – for example, corrupt politicians may be caricatured. Father Jack used this form as a way to explore some of the following questions: What was the experience of newly arrived Mexicans in the United States? How did families live with mixed resident status? What did the Anglo community, at least in an agricultural area, really feel about the Mexican and Mexican American population? The answers to these questions were illustrated by the characters of the Shepherds and Devils in the play. 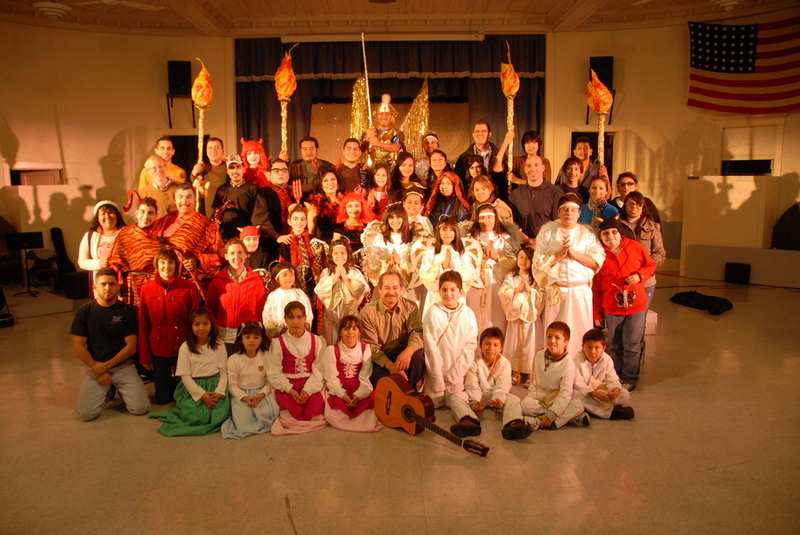 In 2007, DXM Theatre premiered the first La Pastorela de St. Joseph at St. Joseph Catholic Church with 18 adults and children in a racially mixed cast of first time performers. This production laid the groundwork for the development of a Christmas tradition in Yakima that bridges Latino and Anglo communities in the creation of a community-based story play. The intention of the project was always to transfer leadership – creatively and as producers to the community. In 2010, after three years of operating in a producing and creative capacity the leadership was transferred to a local group, many of whom have no formal training in the arts. The show still happens on an annual basis in Yakima.